At the outbreak of World War I, Fay’s isolated life on bleak, windswept Breaksea Island takes a dramatic turn. As a lighthouse keeper’s daughter, Fay knows semaphore and Morse code and responds when the soldiers on the ships signal to her. Soon, the soldiers are semaphoring messages for their loved ones, which Fay then telegraphs on their behalf. Although they never meet,At the outbreak of World War I, Fay’s isolated life on bleak, windswept Breaksea Island takes a dramatic turn. 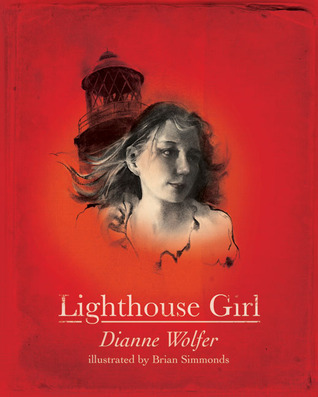 As a lighthouse keeper’s daughter, Fay knows semaphore and Morse code and responds when the soldiers on the ships signal to her. Soon, the soldiers are semaphoring messages for their loved ones, which Fay then telegraphs on their behalf. Although they never meet, Fay eventually becomes friends with one young soldier who has no family. After the soldiers depart for the battlefields of Egypt and Gallipoli, Fay follows their fortunes and continues her long-distance conversations with them through letters and postcards. Drawing on archival material and interweaving fact with fiction, Fay’s tale is based on a true story and brings to life the hardships of those left at home during the war. This was a sweet little book. A little shorter than I expected, it was over before I knew it! But I really enjoyed it even as it was a little younger than what I usually read. I loved the photos, and the illustrations were beautiful.I liked reading from Fay's journal the most.I was really interested in the morse code, too. Fay is very clever. The picture of her at the back of the book is one of my favourite in the story. I also liked the Kangaroo mascot in Egypt. I loved it. I'm biased because I live in Albany but it gave me some fresh insight into life in this beautiful town at the beginning of last century and at war. I highly recommend this to all who are interested in Australian History and Albany specifically. A wonderful way to bring some Australian history to life. A mix of text, illustration and snippets from newspapers and postcards of the time. The main character has been taken from a real family of the time and this further adds to the gravitas of the story. Although it starts a little slowly, this is a gorgeous World War I story written for primary school aged children but still enjoyable for adults. It's beautifully presented and works in interesting information about Australia's role in the Great War. What a lovely, moving read for junior fiction. I liked the way it was part in journal format as well as telling the story. Will read Light Horse boy next. A beautiful book. Nice mix of picture, diary, 3rd person and history. Use with WW1. This is a very nice book. I really liked it! The perfect book to read before Anzac Day. A pleasant read, suitable for younger readers.